Consonantly Speaking: Welcome to Consonantly Speaking! 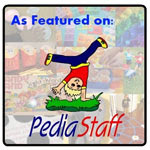 This website was created by a licensed speech-language pathologist to share information, materials, therapy ideas, and thoughts on the field of speech-language pathology. 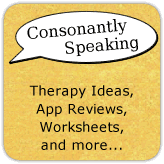 It is called "Consonantly Speaking" because as speech-language pathologists we are constantly speaking, whether in therapy or at home, and we are teaching about/using consonants. Please feel free to use my ideas and materials in your therapy or at home. If you link to them on your website, Pinterest, Facebook, or other social media account, please credit Consonantly Speaking as the creator. You may print and use my creations (worksheets/graphics/visuals) for personal or professional use, however, you may not re-sell them, publish them without my permission, distribute or produce mass quantities of them. Please do not steal my ideas and credit them as your own - when in doubt, credit the author. Thank you for your cooperation in this! Prior to reading more or using information, materials, and ideas written/posted on this website, I strongly encourage you to read the Policies and Disclaimer page on the right hand side of this website. It will give you information regarding copyright, use, accuracy, privacy, individualized treatment and external links posted on this website. I am looking forward to sharing ideas with you and collaborating with other professionals in the field of speech-language pathology! Welcome!